Adding pops of yellow to your decor is a fast and fun way to welcome summer into your home. 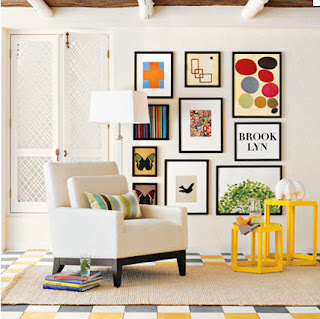 Play with layers of colors and patterns to create a vibrant look for your home sweet home! I know....it's so hot here in Texas that it seems crazy to incorporate anything to do with the word sunshine to our already HOT homes! 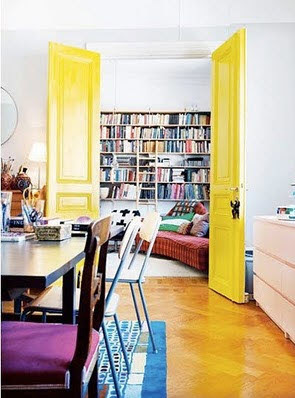 I think you will be pleasantly surprised at what an impact yellow can make to your interiors. Take a look at see! 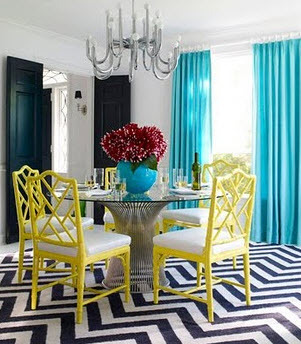 Yellow and turquoise creates an elegant and playful mood. 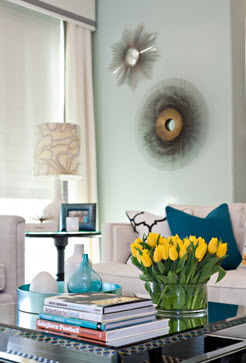 Adding yellow flowers to a coffee table is a vibrant WELCOME! I have to find somewhere to incorporate this look into my home! What a statement these doors make! 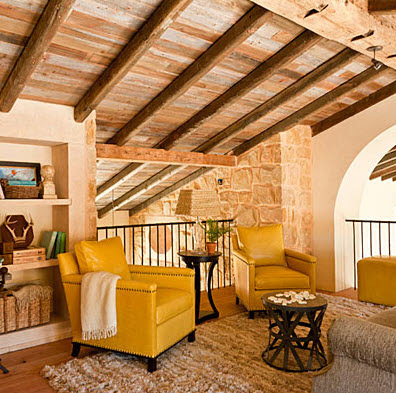 This Loft room from The Southern Living Texas Escondido Idea House is so delightful and warm! 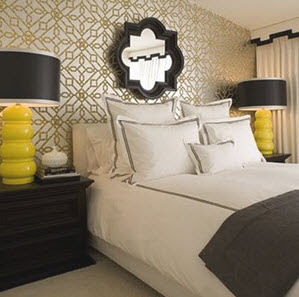 The neutral backdrop allows the home owner to add whatever color they want to. 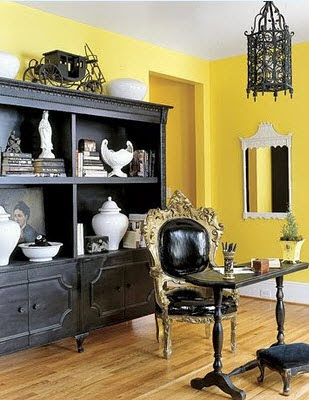 Yellow leather chairs with nail heads is a perfect fit for this charming living area upstairs. They will grow more beautiful with age. The club chairs are bulky but notice how the designer softened the look with a round coffee table and round side table. They are also open underneath and the perfect scale in order to allow the space to feel bigger and more spacious. 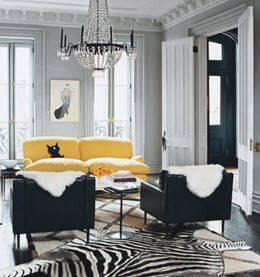 Yellow and black compliment each other well in this living space. The zebra rug is my favorite! 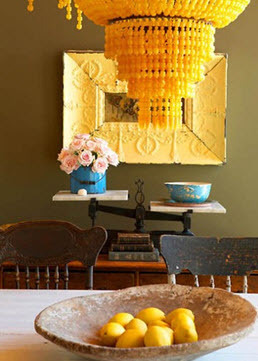 A yellow chandelier for those of us that are brave! Full of sunshine! What amazing lamps! What a wonderful office space. 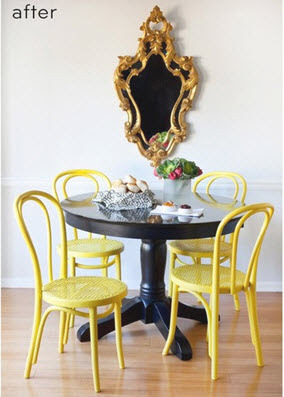 The yellow (gold) wing back chair combined with the round work table is a perfect fit for a functional space. 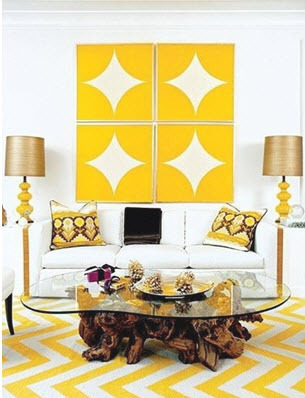 Can be used to meet with several clients or for relaxing with a book with your feet up on the matching yellow ottoman. Love the painting hanging on the bookshelf. The gold frame marries the elements together in a beautiful grouping of three. 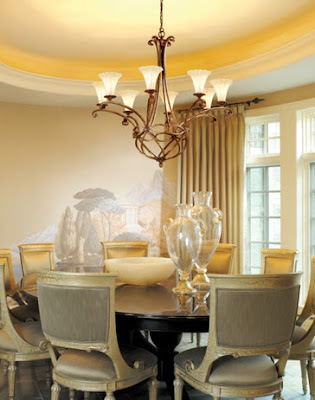 This dining room is captivating. 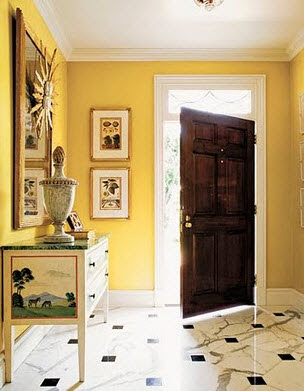 I'm in love with the soft yellow in the ceiling alcove. 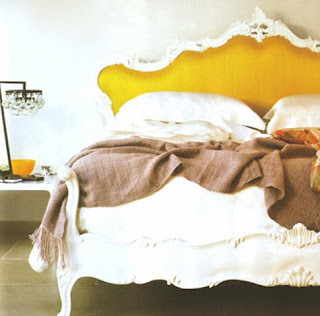 Such a beautiful addition and adds a bright cheerful feel. Just think about how romantic it would be at night. Without the yellow band, this ceilings architecture would not have been much of anything. 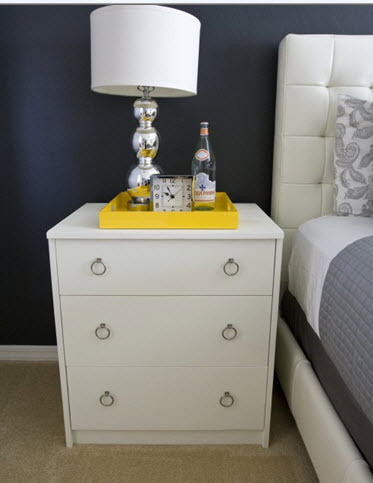 Decorating with yellow can be as simple as adding a tray to your bedside table. Or adding an interesting piece of original art to a room. 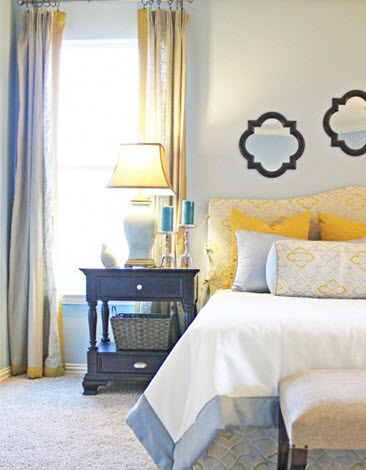 Accessories and pillows can play a huge impact in a room! 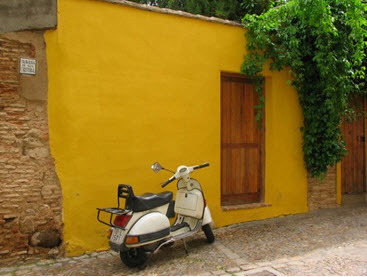 Yellow paired with this lavender color is gorgeous isn't it? Crazy about the white throw on the arm chair. This room is not over done, it just makes a statement because of the scattered pops of color. 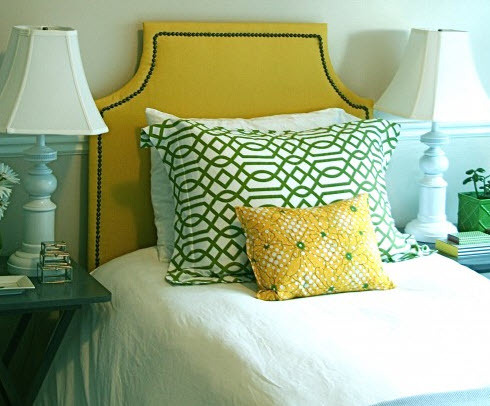 A yellow headboard is thrilling combined with Kelly green. This master bedroom is a happy yellow. 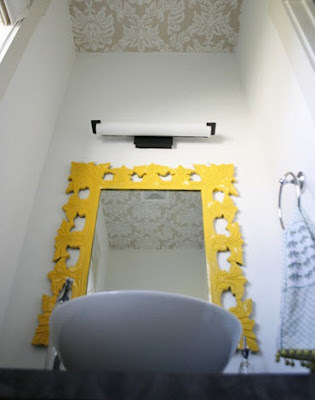 I love how they put a band of yellow on the drapery panels to tie it all together. A mirror painted yellow is pure perfection in this powder bath. 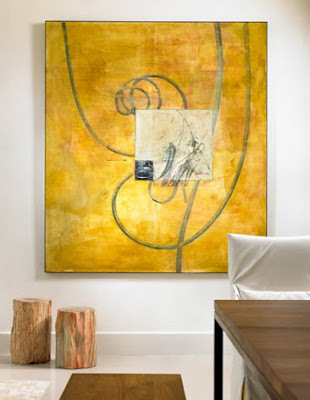 How about a yellow rug and some large artwork in a grouping of 4? A yellow door is a great introduction to who you are! I'm wondering if I could pull off this yellow wall in my courtyard? 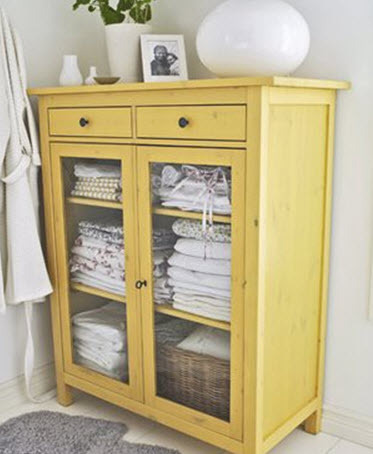 A yellow dresser, vanity, bench or headboard is always a bit of drama in a room! These chairs made me smile. I would be a guest in this room. The painted brick is an added texture to this backdrop. The bedding looks very crisp and cool for summer. This entry would welcome you home if you'd had a bad day! Notice the back of the bookshelves are painted brown. 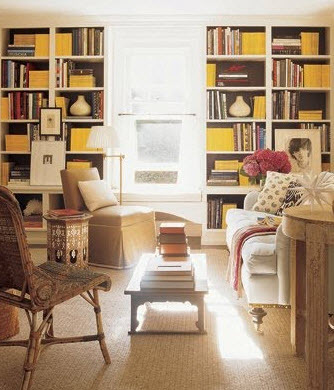 A subtle touch that acts as a nice backdrop to these yellow books. I don't think these are Yellow pages (phone books) or National Geographic Magazines. 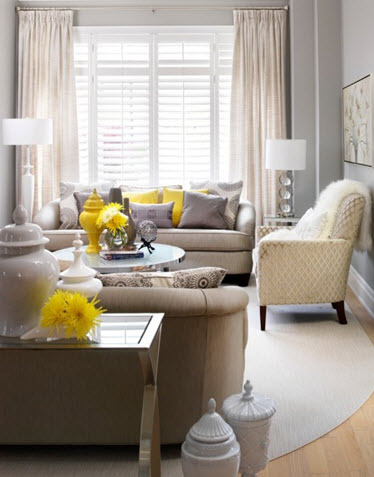 A tiny touch of yellow in this room by using side tables. It's perfect! Nice way to incorporate the floor. 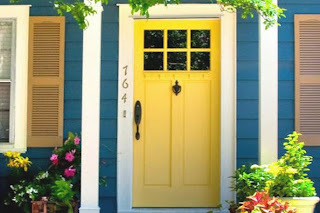 Go add some summer sunshine to your home! Visit DecRenew Interiors and set up your design consultation today!